What is this large, green thing? 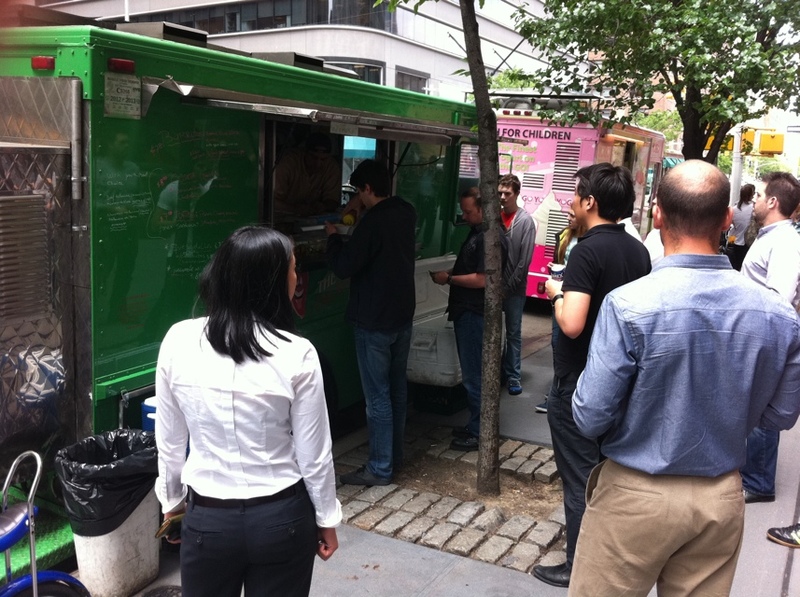 It seems the flood of food trucks can not be stopped. Everywhere I turn a new one (or at least a truck that’s new to me) turns up. 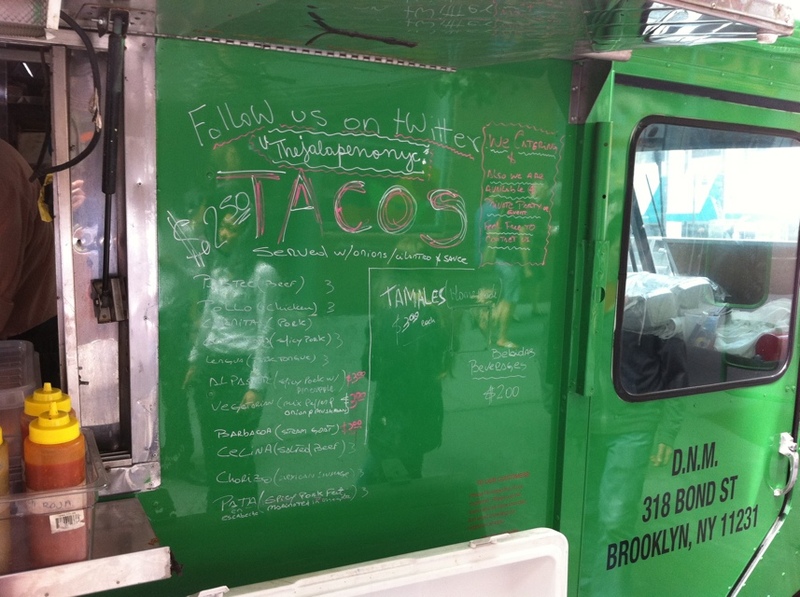 The latest example: the Jalapeño NYC truck, which offers tacos for $2.50 and burritos for $7.50, plus a number of awesome sounding specialties that I’d very much like to try if I return to it (a traditinal Cemita, for example, with oaxaca cheese, beans, avocado and chipotle). Gotta love that logo. Simple, classic. I have to say with the burgeoning number of gourmet trucks rolling through New York these days, it was nice to see one take a more simply-designed approach. I thought the image on the side of the sweating pepper was pretty funny. Handwritten menu was somewhat hard to read. The prices, not so much. Their menu encompasses both sides of the counter, with tacos and tamales on the right and those other specialties (and of course burritos) on the left. I was impressed by the depth of selection. However, when I ordered my al pastor tacos, I was told they didn’t have pineapple, so they suggested the “enchiladas taco” instead, which was apparently spicy pork. 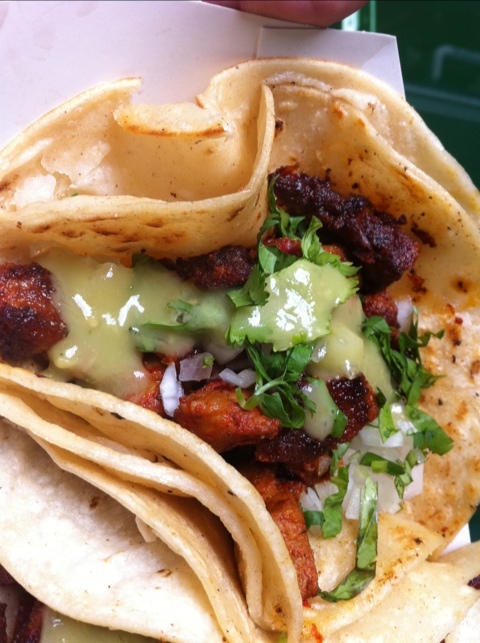 Heck, at $2.50 a taco, it seemed well worth a run (the al pastor would’ve been $3). The condiment counter. Very nice touch. One thing I liked about the truck was it’s seasoning station at the front. 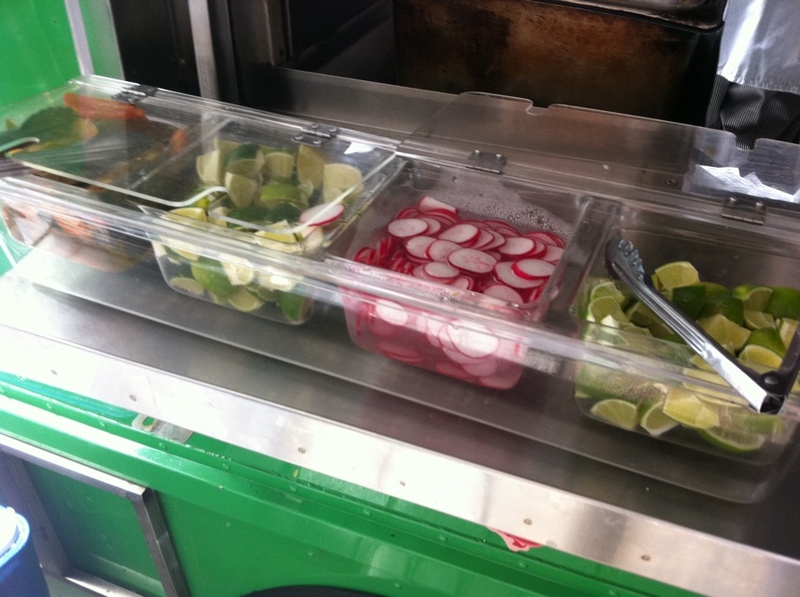 The offered fresh limes, a variety of salsas, peppers and radishes. How excellent. 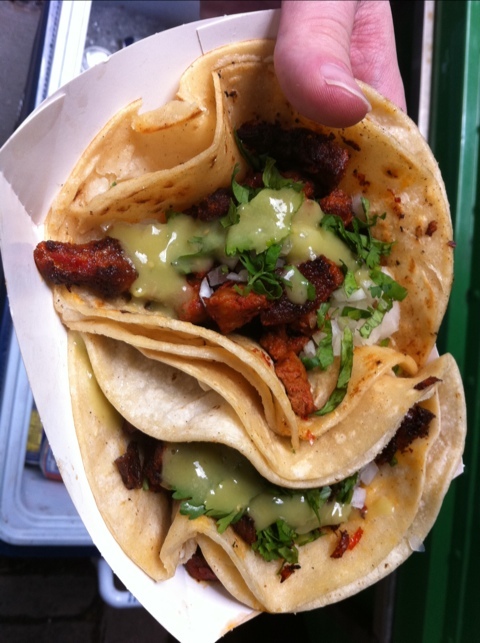 The spicy pork tacos, aka 'enchiladas,' from the Jalapeno NYC truck. Let me say that after I agreed to the order I was totally confused as to what to expect. I thought enchiladas were tortillas with a filling covered in cheese. I was pleased when I got the simple-seeming, hearty pair of tacos. Just $5. However, for something called spicy pork, it was not noticeably spicy. It was well cooked and flavorful, and I was delighted to be able to squeeze a little fresh lime over them. The onions and other loose veggies didn’t really pop, flavor-wise, though the corn tacos were delicious. Since the image on the side of the truck (sweating pepper) – and the truck’s name (Jalapeno NYC) – and the dish itself (spicy pork) all suggested spicy heat, I was really surprised to find this smoky, flavorful taco to be not spicy at all. That said, I didn’t mind. 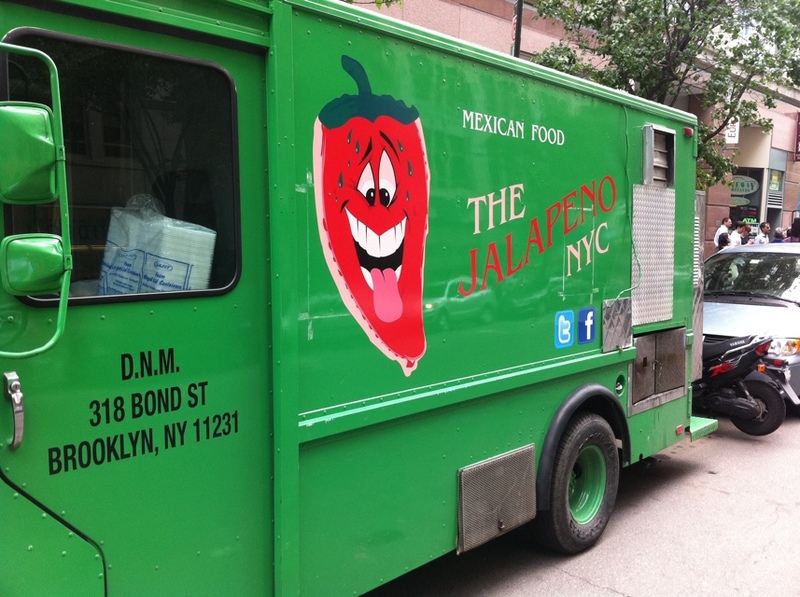 I should add that I did not apply any of the salsas that were offered on the counter of the truck, which I suppose must add the kick you might expect from a place that calls itself Jalapeno NYC. All of this is not a knock on the food, which was simple and hearty, as I mentioned. Very straight, classic and tasty taco for just $2.50. I’d certainly go back, and look forward to trying their other stuff. I imagine their burrito must be a whopper. For more information, follow them on Twitter.